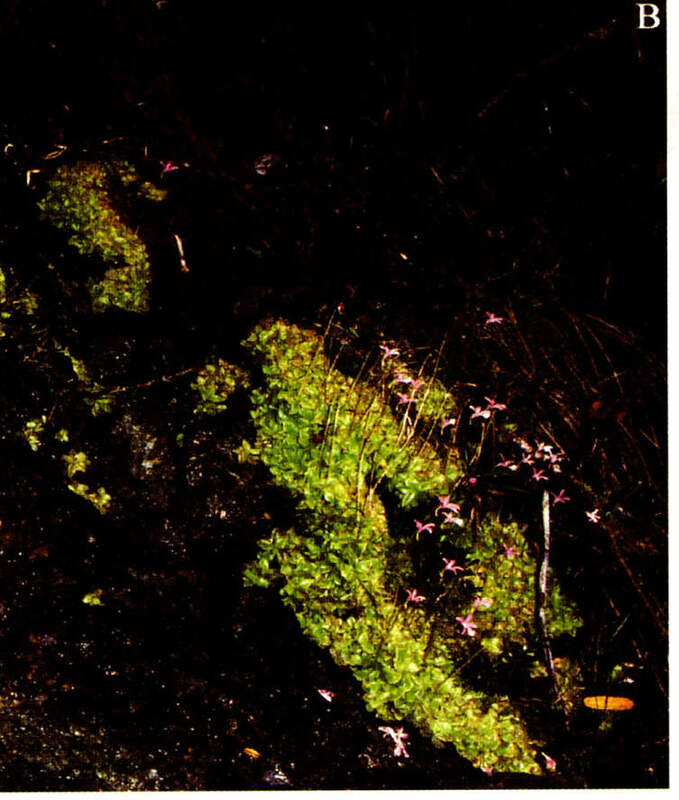 Publication : " Two new Pinguicula species (Lentibulariaceae; P. benedicta-Group) from the eastern mountain range of Cuba (Greater Antilles) with reddish flowers " by S.Jost Casper in Wulfenia 11 (2004) 1-13. Ethymology : The epithet has been chosen in honour of Prof Dr. Hannes Bisse, who initiate the German-Cuban cooperation to study the flora of Cuba in 1966. Herba perennis, rosulata. Lamina filiorum circuitu oblonga to suborbiculata, ~10(-12) x 8mm longa, margine non involuta plana solum adpressa; flores parvi vel mediocres, ~15 x 20mm longi (calcari incluso); corolla pallide rubra vel albescens, lobis oblongis inter se non tegentibus; scapi 1(-2) erecti, ~10 - 12 (maturitate up to ~18)cm alti, teretes. Perennial rossulate herb, in flower up to 12 cm, in fruit up to 18cm tall. Rhizome short, with many relatively strong roots. Leaves 4-8(~10), rosulate, simple, yellowish green, in outline suborbiculate to obovate, ~8(~12)x8mm, base shortly attenuate, margin entire, slightly revolute, upper surface densely covered with sessile and stalked glandular hairs. Scapes 1(2), ~8-12(18)cm tall, ~1/2mm in diameter, one flowered, covered with sessile and stalked glandular hairs, in flower and in fruit nearly up straight. Flowers two-lipped(with a subisolobe tendency when adult), ~15-20mm long (spur included), wide open, lobes bent outwards, corolla pale red to white, tube red to (in the white flowering individuals) greenish to white. Calyx two-lipped, greenish, reddish to purple, sparsely covered with glandular hairs; the upper lip deeply tri-lobed, lobes oblong apex rounded, the lower lip up to ¼ of its length two-lobes, the lobes oblong not spreading. Corolla pale red to white, the lobes nearly equal (the middle lobe of the lower lip always longer than the other lobes), oblong, rounded at the apex, preading, not covering themselves, in the region of the throat with multicellular uniseriate hairs without distinct head cells; tube subcylindric to funnel-shaped, without palate; at the throat, on the bottom in the tube and in the spur particular zones beset with characteristic patterns of white hairs of different shape and size; ~5-6mm long, adult as long as the corolla lobes; spur green, red or white, continuing the tube, forming an angle of ~20-140° with the tube, ~5-7mm long, over its whole length equal wide, at the apex blunt, rounded; sometimes (especially in the white flowering individuals) with a coloured (red, green, yellowish, white) ring in its lower part above the apex. Fruit globular, small, no longer than the persistent calyx. Seeds not seen. 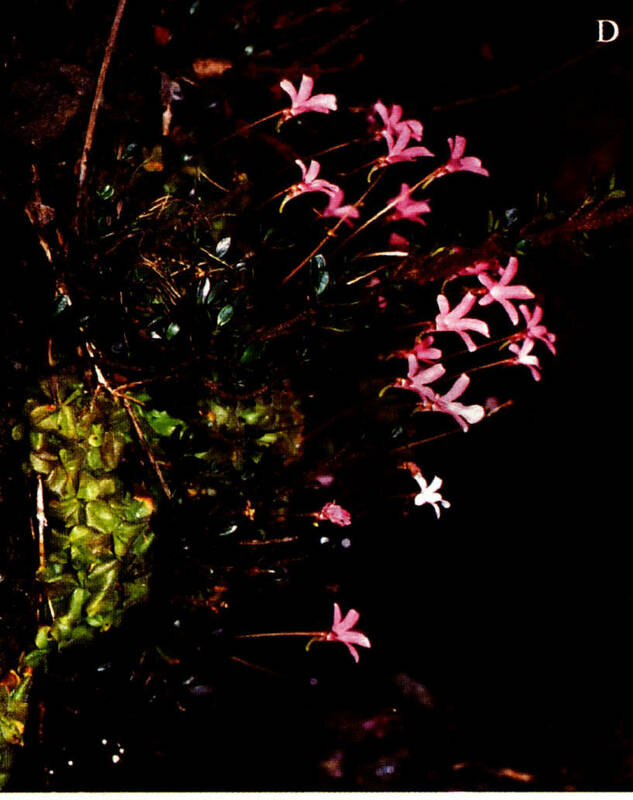 Between the years 1966 and 2003, numerous expeditions from German and Cuban botanists in the eastern mountain ranges of Cuba have led to the collecting of fresh material, photographs and notes of many no-white-brown flowering Pinguicula specimens. 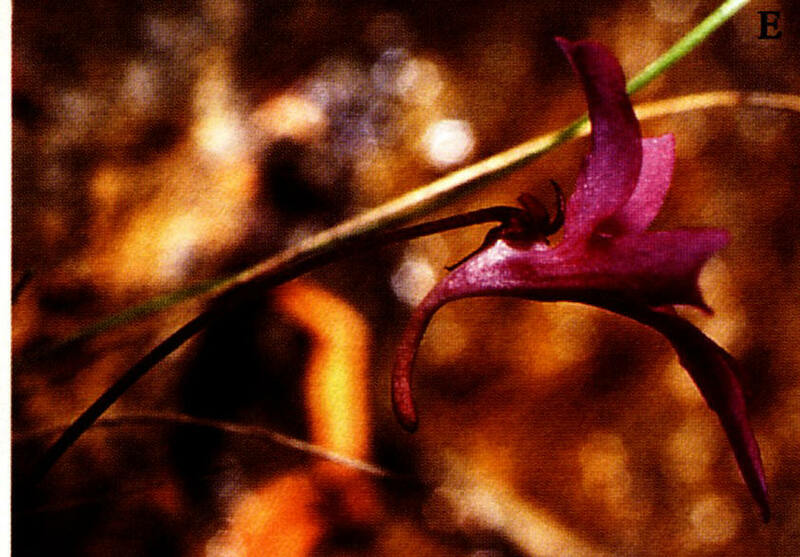 In the last years, several new species have been described including P. bissei. This species is a close relative of P. benedicta. From Eastern Cuba, province of Guantanamo, Alturas de Baracoa, Camarones, Orillas de Rio Baez, entre Camarones y Minas Amores ; Alt. 155 m.
Pinguicula bissei is growing near the springs of Rio Baez, a short rivulet (about 12km long) coming from the hills ~2km west of the village Camerones and flowering into the Bahia Baez (oceano atlantico) ~3km NE of the village Baez. The photographs of the original description paper display plants growing on wet rock surfaces. P. bissei has been grown at the Jena Botanical garden at the institution of the author but has not been shared with other Pinguicula enthusiasts (restrictions from Cuban Authorities ?). Not a lot is known on its culture yet but here are the data we have on P. benedicta. The photographs taken by R Mangeldorff and presented in the original description of P. bissei display specimen with green leaves. A close-up picture reveals the existence of purple veins in the plants. 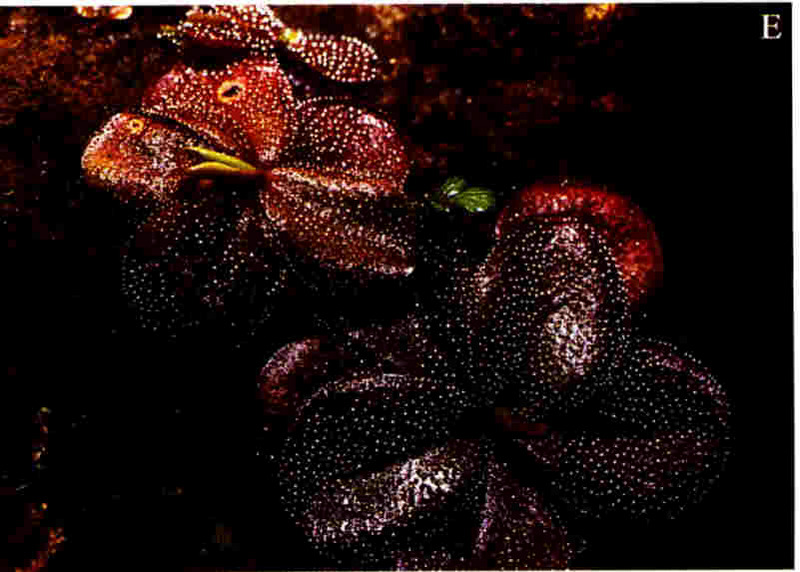 One specimen with dark purple leaves is presented with the mention that it is linked to the ‘blazing sun’ under which these unusual plants were growing. Another unusual plant is also displayed that harbours totally white corollas. This plant was growing next to ‘normal’ pink-flowering specimens. The pictures below are extracted from the original publication of S.J. Casper in Wulfenia 11 (2004) 1-13. We really thank Mr. Casper for having authorized us to show here some of the most representative photographs. Many more pictures are published in the original publication and we really encourage you to buy it from the publisher. Locality of the type specimens sloping down to the river (~1:25). P. bissei was flowering with white and pale red flowers. from Wulfenia 11 (2004) 1-13. P. bissei was flowering with white and pale red flowers. 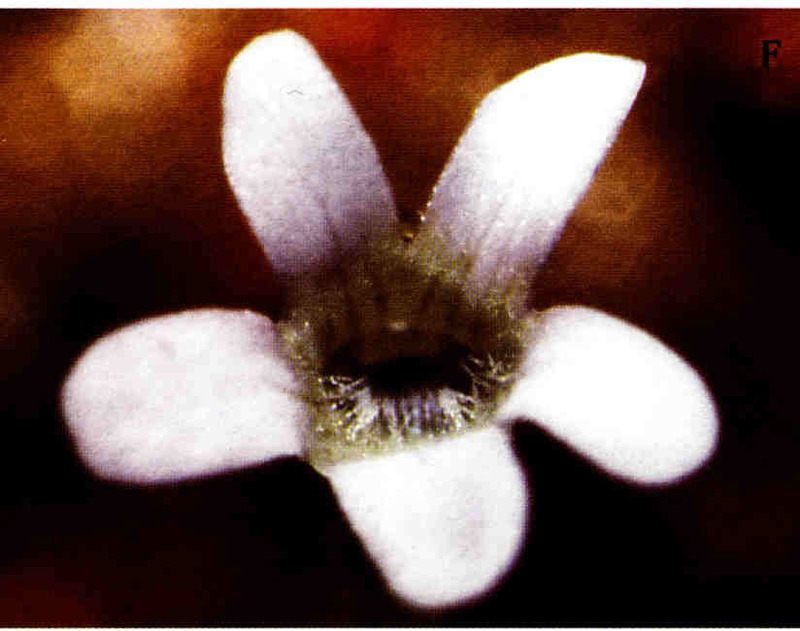 Flower of P. bissei in front view, showing the oblong spreading not covering corolla lobes, the sprasely haired and inconspicious pattern of darker nerves at the entrance into the throat (~3:1). White flower of P. bissei in front view; it is densely white haired at the base of the corolla lobes of the lower-lip and in the throat. In the background of the tube the whitish stigma is discernable. (~3:1). P. bissei with purple leaves apparently growing in the blazing sunshine. 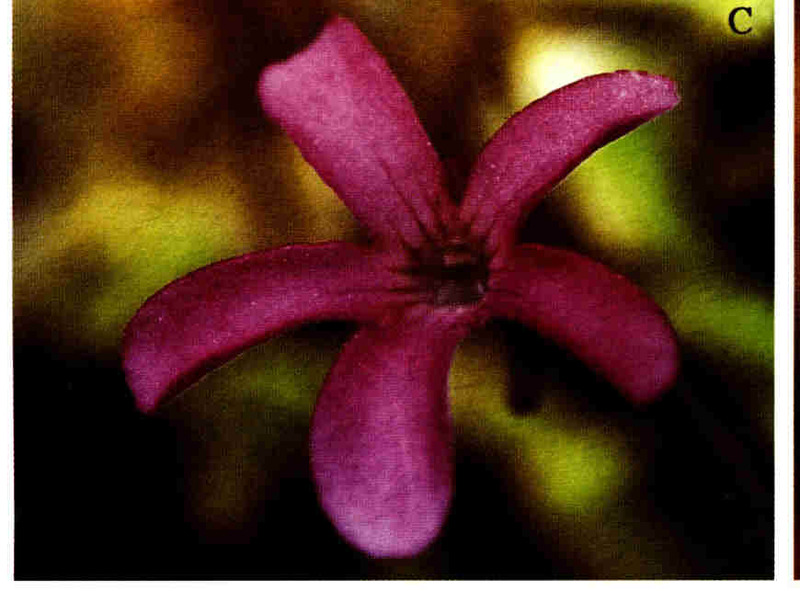 Flower of P. bissei in side view with their typical wide open corolla (here nearly 180°), the short cylindrical-funnel-shaped veined tube and the thin, over its whole length equally wide spur forming an angle of nearly 90° with the tube. In this ndividual the colour of the spur is that of the flower at all. The calyx is purple-coloured.